Social media monitoring is fast becoming a requirement for modern brands who looking to support their customers on social media platforms, keep an eye on competitors, and/or find relevant influencers. But it can also be a daunting task - with so much discussion happening online, you can easily get swamped by irrelevant mentions, which not only waste your time but can also impact your analytics in a negative way. TweetDeck is a free Twitter tool with impressive search capabilities and scheduling options. But before we dive into the 'how' of creating more complex Boolean expressions for brand monitoring, lets start with the basics - without going into too much technical detail, Boolean search enables users to create more specific queries for more accurate results and better reporting. By using your keywords, along with Boolean operators, you can either restrict or broaden your search expressions, and improve your results. Here are five steps to help you nail Boolean search for social media monitoring. Boolean logic powers up a search query and makes it more adaptable to your needs. But that said, not everyone will need it. If, for example, you don't have a brand name that can be used in multiple contexts, a regular search will likely tackle the task. The name of the brand is a common or ambiguous word - e.g. Apple, Slack, or Uber. Using such a name as a keyword will likely bring a ton of irrelevant mentions. Boolean search can help to narrow your results by utilizing grouping or negative keywords. Combining groups of keywords - Let’s say I own a streaming platform - to find people looking for a service like mine online, I might use phrases like 'streaming service', 'streaming app', 'streaming platform', etc. 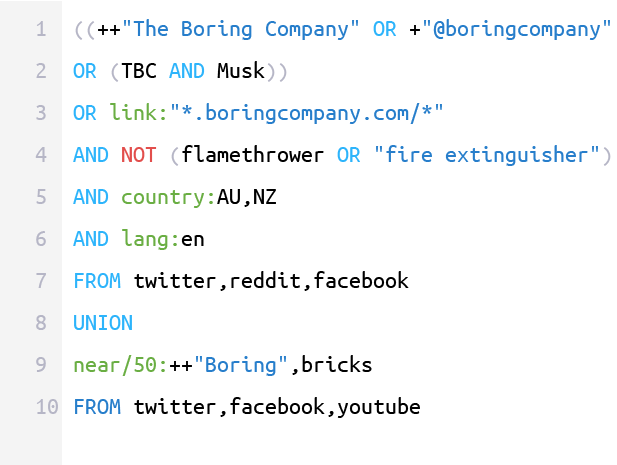 Using Boolean, I can combine this group with phrases people use to ask about something, such as 'looking for', 'recommend', 'I need', etc., enabling broader, more accurate mention matching. Searching for linkless mentions - With Boolean search, it’s also easier to create queries which exclude mentions that already have links to a particular website. You can also filter results by language or country, and the same operator also makes it possible to discover new backlinks as they appear. Checking for plagiarism - This is probably the least obvious case for using Boolean search, but it works, and it works great. You can set up a query that will search for exact matches of pieces of your content across social media platforms and on the Web to see if someone's using your work without permission. Before playing around with your first query, it's a good idea to get a clear understanding of what keywords should be included, because the tool will ignore lots of relevant results otherwise. It’s extremely important to research all alternate brand spellings, common typos, and acronyms - in the example below, you can see that the most popular brand name alternatives are listed, along with relevant social media handles and a hashtag. Major Boolean logic operators that any social monitoring tool has are 'OR', 'AND', 'AND NOT'. To search for a specific word combination, or an exact phrase match, you can list the term/s in quotation marks. If you place the plus sign before the quoted phrase, the app will respect special characters and punctuation marks, while double plus before the quoted phrase will ensure the app also considers letter case. This operator searches for either or both listed keywords. Note that all operators can be used multiple times within a query. In this example, we'll add a social media handle, which is spelled as a single word. This will enable us to monitor conversations where people tag the company. Then we can also add the 'TBC' acronym - it's not used as often, but we’ll include it for the sake of an example. Predictably enough, the query above will bring lots of irrelevant mentions, as 'TBC' has a huge amount of full forms. The 'AND' operator will help us make sure that the results include a specific keyword or a group of keywords together with those we already have. 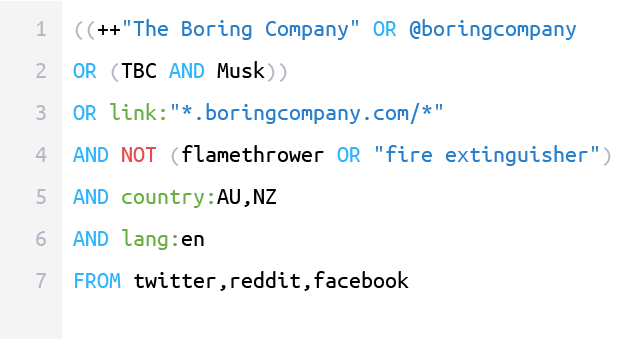 I’ve added the last name of the company’s CEO - this will show us only results where 'TBC' is mentioned in the same post as Musk. The 'AND NOT' operator is used to add negative keywords to your search. For example, let’s say you want to stop getting conversations where people discuss the fact that the company sells flamethrowers. The next step in improving our search is grouping the keywords and assigning special keyword formats to them. It’s pretty straightforward here - to group a couple of keywords, you can list them in brackets. For example, let’s imagine we want to add more negative keywords using 'OR'. We have to be sure to group them, otherwise, the 'OR' operator will be applied to the rest of the query. Within Boolean search, you can also filter your results by country, language, or social media platform with the help of 'country', 'lang', and 'FROM' respectively. The first two can be used together with the 'AND' operator, while 'FROM' is used independently. The 'link' operator will help us with these tasks. Let’s include the link to the website just to make sure we don’t lose any mentions where the anchor text is different from the URL. Note that adding an asterisk before and after a URL makes sure that links to all subdomains and pages of a website will be found as well. This operator specifies the closeness of your keywords to each other - this means that your search app will pull in mentions where keywords appear within a number of words away from each other. Let’s imagine that we've decided to monitor news about 'Boring Bricks' produced by the company from the examples above. Quick research shows that, in news report, these words generally appear in a different order and the distance between them is also different. Let’s choose the safe distance of, say, 50 words and see if we get good results on Twitter, Facebook, and YouTube. To make sure we don’t get irrelevant mentions, we'll look for those starting with capital letters only. 'UNION' helps in combining multiple Boolean expressions into one. This makes sense if you want to merge a couple of search expressions with completely different parameters and different sources into one expression, i.e. get all results into one feed. As you can see, the last two examples above have different sources. If we want to merge both expressions, we’ll need help from the 'UNION' operator. This one is common. Keep in mind that a query won’t be correct until you capitalize the 'AND', 'OR', 'AND NOT', and 'FROM' operators. If a query is (or seems to be) ready, but the results are completely the opposite of what you expected, the problem is most likely the grouping. Remember that if not grouped, 'AND' or 'AND NOT' are applied to the closest keyword only. Languages are flexible, and the same phrase may be constructed differently depending on its place in the sentence. For that purpose, the proximity operator 'near/n' will often do a better job than putting a phrase into quotes. They aren’t, and they ignore symbols and capital letters unless you specifically tell them not to, using such keyword formats as +“h&m” or even ++“H&M”. It’s difficult to foresee all the possible outcomes of queries, as a brand abbreviation may be also used by another company, or an initial negative keywords list might not be complete. But the good news is that queries can always be edited and extended. My advice here is iterate, blacklist, remove, add terms, and to experiment with different operators. Social media is a great place to get instant feedback or content for your company. When choosing a brand monitoring tool, make sure Boolean search capability, and unlimited keywords are included in the product to maximize this capacity. Is Boolean hard to use? It can look intimidating at first, but learning the process really is worth the effort, and you can easily find lots of educational resources for the topic. Take advantage of Boolean search to get the most relevant results possible - and happy monitoring.